Tony and Ed needed to create playable instruments from their recordings to make their workflow better. They had source sounds of glass marimbas, bowed guitars, woodwinds, singing bowls and other instruments. Every time they used these sounds, they would drag the audio file into protools and manipulate the audio to fit the cue. This was a very slow and unmusical process. The idea was for them to give us their source sounds, organized into folders, and tell us "Ok, create pulses with these sounds, create pads with these, cut these guitar improvs into a chromatic keymap" and so on. Some of the sounds were very well recorded while others were field recordings that needed cleaning up. Presenting ‘mastered’ versions of their sounds was very important. 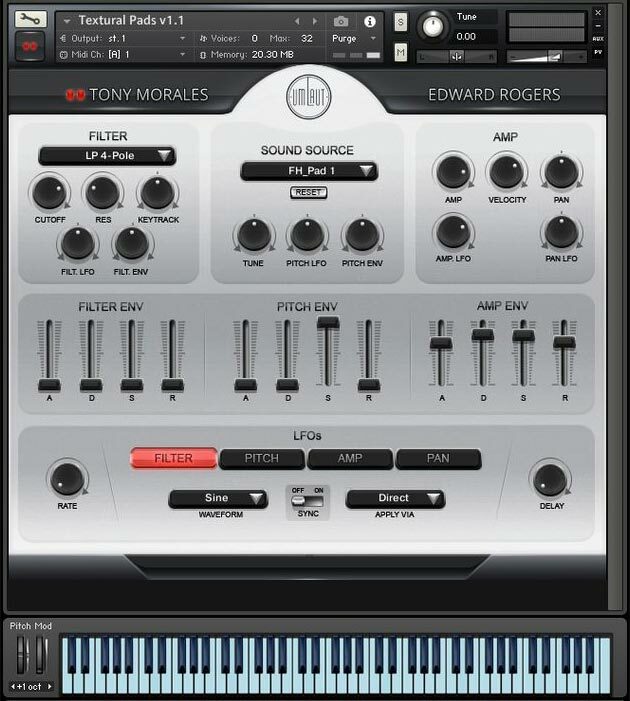 Our solution was to create a pad and motor Kontakt instruments based on recording sessions made by Tony and Ed. We also needed to transform their source sounds into pads and motors, edit and clean up the sounds. Working only with the single source they gave us, we needed to create octaves via pitch shift. Filter section with dropdown menu for filter type and basic filter controls. Amp section with basic amplifier controls. Three Envelopes to control Pitch, Filter and Amplifier. Four LFOs to control Pitch, Filter, Amp, and Pan.